If it’s July 4th, it’s time for a parade! In my community, as in many communities across America, a parade is the time for neighbors to come out and cheer on the family, friends, and local community groups who will walk proudly past. In my town we haven’t always had an Independence Day parade, but now it has become a tradition, and it’s a real treat to have the parade come up my street. 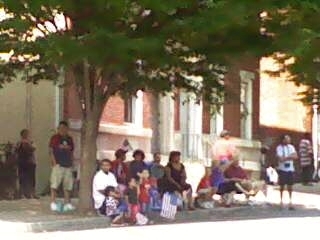 Sitting curbside, my family and many neighbors line either side, extending kind words and jovial greetings as we anticipate the fire engines that will lead the procession. 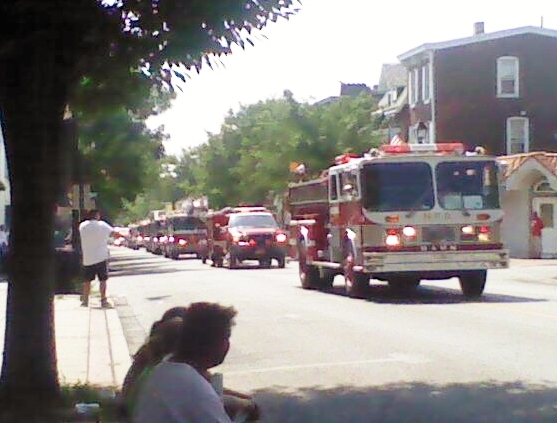 With full blaring sirens, the sound and appearance of the fire trucks signal that the parade is approaching. We counted 10 fire trucks this year, not including some of the smaller vehicles. Our firefighters are proud to serve and love to participate in parades. This is the Uptown String Band. I was admiring the costume the man in the front was wearing, but it was hard to get a good shot. One thing I know is that he must have felt so hot dressed that way today! 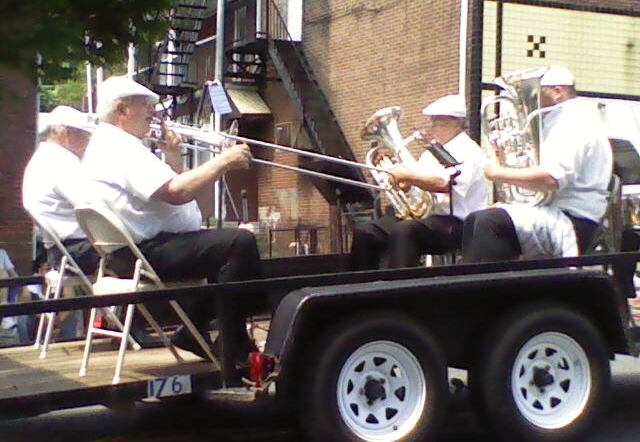 The German Brass Band had it a bit easier than the string band, don’t you think? 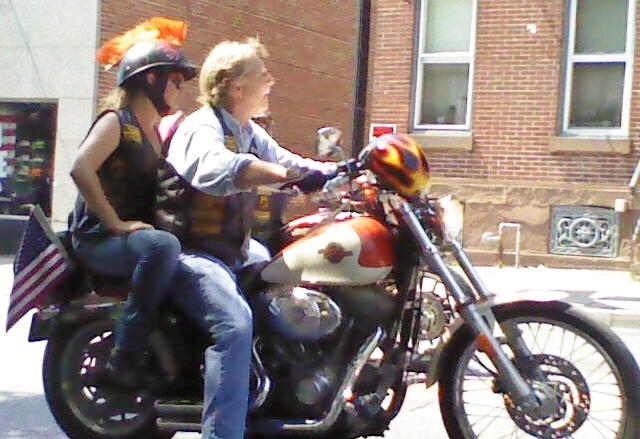 These bikers are part of a group called Hogs & Heroes Foundation. They are motorcycle riders who support Public Safety, the U.S. Military and Wounded Warriors. We had many children’s organizations participate as well. 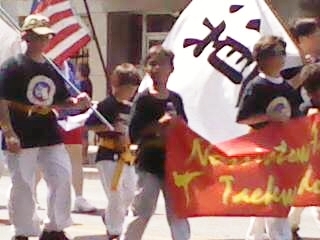 This group is a tae kwon do club. 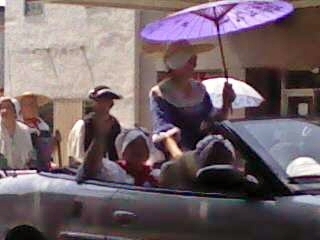 Admittedly, this is not a good photo, but I wanted you to see these “colonial” women riding in a car. It’s an amusing contrast. The parade is a great way to bring family together. I wish I would have taken more photos, especially of my family and the many spectators who came out. I would have liked to have captured more photos of the colorful groups and the horses in the parade, too. 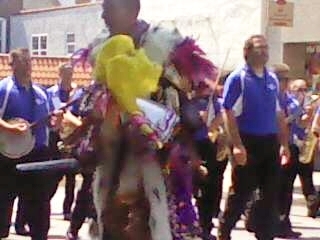 But it isn’t easy to photograph a moving parade, and with a small camera phone, at that! 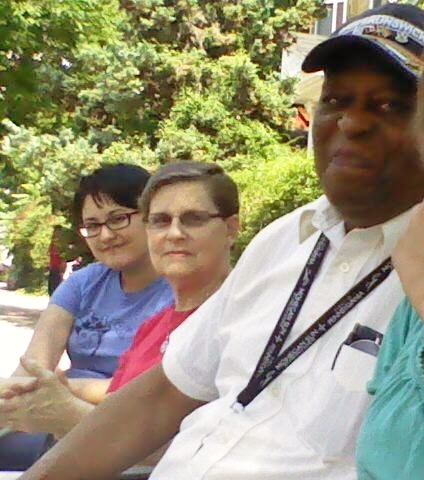 In any event, the parade was fun and over too soon – I wouldn’t have minded if it would have circled around and come by one more time, although I am sure that the many people in the parade would have – it’s just too hot and humid today! I guess like everyone else I will have to just look forward to next year’s parade.